Charming Le Moana Bora Bora was the first Bora Bora resort we stayed at. After much research we chose Le Moana because it promised sparkling Intercontinental standards with a warm, authentic island ambiance. We found that most of the staff were friendly islanders. The Matira Beach location was very convenient for getting around and there is a variety of choices for eating outside the resort. 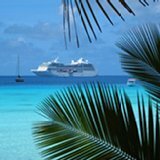 We stayed on Bora Bora Island in style, with an affordable price tag. 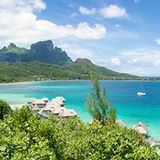 As Le Moana Bora Bora is on the main island you can opt to save money by utilizing the Air Tahiti free boat shuttle from the airport motu to Vaitape, and then catch a taxi to the resort. 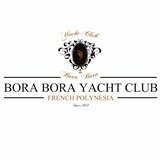 If you want to begin your Bora Bora resort experience at the Bora Bora airport you can book the resort's shuttle. We enjoyed the anticipation of arriving by water on the resort's shuttle. First we spied the incredible stretch of white sand, Matira Beach (voted best beach in the world by CNN GO in November 2011). 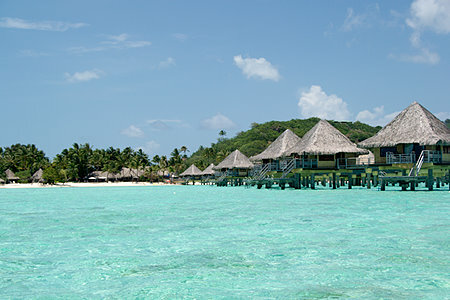 On the right, the romantic bungalows of Le Moana stood in shallow, turquoise water. As we stepped on to the pier our luggage was whisked away by bicycle. After being escorted through landscaped, tropical gardens to a large, thatched roof, reception area, we relaxed in comfortable seats and were refreshed with scented face-cloths and fruit drinks while we checked in. The honeymooners who had shared the shuttle from the airport were already playing billiards. Even though it was only 11.30am our beach bungalow was ready for us. On the way a friendly Polynesian mama gave us a walking tour around the resort's facilities. 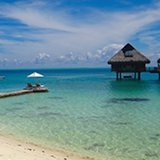 Beach Bungalow or Over Water Bungalow? 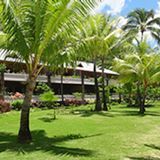 The Le Moana Bora Bora is a smaller, more intimate resort with 64 medium size bungalows of similar design. 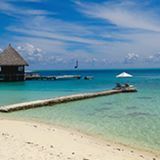 So your choice is between lolling about on an exquisite beach front amongst lush gardens, or having an over water adventure with a lagoon or horizon view. 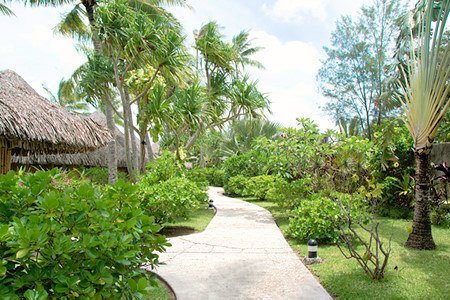 We chose to stay in one of the 14 bungalows set right on the beach (number 58) and it was a fantastic experience. We were in a tropical garden, with sugary sand and turquoise lagoon at our front door. I felt such pleasure just walking along the path to our villa, passing through lush fragrant gardens and under a romantic arbor with exotic flowering plants growing over it. 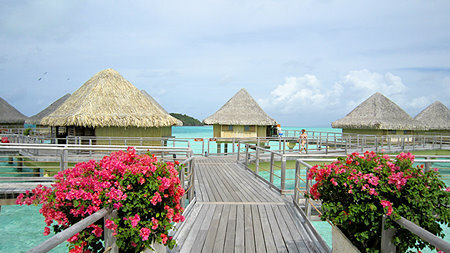 The Beach Bungalows look out to the pretty overwater bungalows sitting above the blue lagoon. It really is a beautiful view. I actually felt that our view of the tropical beach, out to the lagoon and the overwater bungalows was equally, if not more beautiful, than the view from the overwater villas. Walking into our immaculate villa was a delightful surprise. 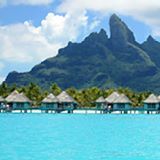 These villas might be medium sized by Bora Bora standards but they are light, airy, and very spacious. The interior is gleaming wood, glass, and intricate pandanas weaving. The fabric of every surface is an elegant work of art reflecting the skills of local artisans. The huge bathroom with twin basins, full sized bath and open, separate shower includes a dressing area (toilet is separate). The ample living area, with space for dining, can be separated from the bedroom by a sliding screen. I was amazed when I lay down on the bed and discovered that the huge window was framing Mt Otemanu. I had not realized that this part of the island has views of Bora Bora's signature peak. We could slide the glass door wide open and step outside to sit on our deck or lie on a sun lounge under the umbrella, with just a few steps to the water. Some villas have their own palm out front. It felt so private, even though the resort was booked out (it was just before new year). 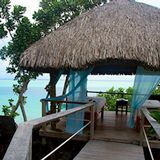 We loved our beach bungalow but we had to close our shutters in the evening to keep mosquitoes out where-as over water bungalows are beyond mosquito territory. The 54 Le Moana over water bungalows have the same medium size accommodation as the gorgeous beach bungalows. Their deck area is larger and steps down to a pontoon for entering the water. 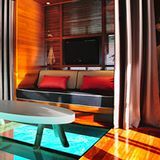 The living room has a glass panel in the floor (under the coffee table) for viewing the colorful lagoon life and you can spot a variety of tropical fish. Coral (monitored by a marine biologist) has been placed under each one as in 2005 a big swell hurt the coral garden. 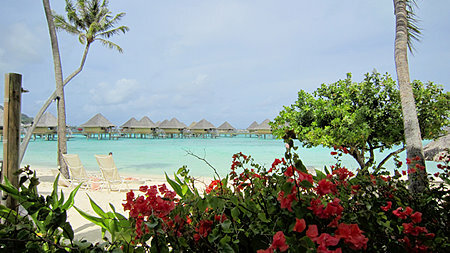 There are 24 over water bungalow lagoon view villas. 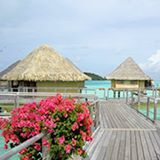 And if you want to feel like you are the only ones in Bora Bora, choose one of the over water bungalow horizon view villas with a vista all the way past the reef to where the lagoon meets the sky. Facing the horizon, there are also 4 white over water villas with a more refined, all-white interior. The Noa Noa Restaurant, at the heart of the resort, serves breakfast and dinner in French, International and Polynesian cuisines. There's a choice of indoor or outdoor dining, with gorgeous views from both. The Vini Vini Restaurant & Bar overlooking the lagoon is open for lunch and serves snacks and drinks in the afternoon. The great location provided many choices for eating at the Le Moana Bora Bora and we had fun trying most of them. A variety of free activities and cultural experiences supplements the relaxing atmosphere of this resort. 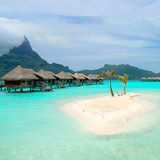 Plus you have easy access to independently explore Bora Bora Island. 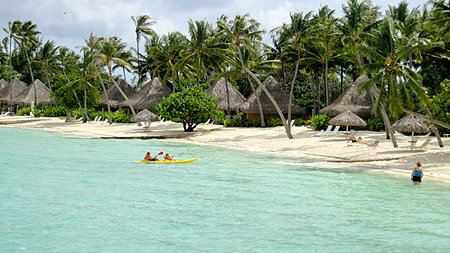 Here you can see the wide choice of activities at the Le Moana Bora Bora. This handy little store has a wide variety of items including local handicrafts, casual clothes, bathing suits, gifts and toiletries. It stocks Tahitian books and specialities like healing tamanu oil. I found a beautiful pareo for a good price. This is one of Robert Wan's pearl jewelry boutiques. He owns the largest pearl farms in Tahiti. 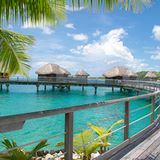 Guests at Le Moana Bora Bora can enjoy easy access to the beautiful facilities at the sister Intercontinental Resort via a regular free shuttle boat. Find out why our afternoon at the Thalasso Deep Ocean Spa was so special.